For 20 years, the Bayshore Marathon was just a marathon. In 2003, the Traverse City Track Club (TCTC) added a 10K to the lineup, followed by a half marathon in 2006. This year, a “Bayshore Kids Marathon” will join the annual Memorial Day Weekend race extravaganza. According to Lisa Taylor, executive director for the TCTC, “kids marathon” races have long been a signature at major marathon events throughout the country. The actual race is a 1.2-mile fun run; the twist is that kids are encouraged to log the other 25 miles – to make up the full 26.2-mile marathon distance – in the weeks and months leading up to the event. A kids fun run is a smart fit for a race that has become one of Michigan’s premier running events. Since it began in 1983, the Bayshore has ballooned into a juggernaut, drawing more than 7,000 runners across its three races last year. It’s also a huge economic driver for the community. In 2015, a study found that Bayshore had an economic impact of $1.9 million that year alone. The growth has enabled TCTC to donate nearly a quarter million dollars to local charities every year. For Therese Larson, meanwhile, the Bayshore Kids Marathon is a chance to continue the work she’s been doing for the better part of two decades. Larson, who is taking on directorial duties for the Kids Marathon, previously served as executive director for the local chapter of Girls on the Run, a nonprofit aimed at teaching young girls life skills and healthy lifestyle habits. Larson took on Girls on the Run as an outreach component of her job as a juvenile probation officer, and ultimately built the northern Michigan chapter to span nearly 60 schools and 200 involved coaches. Each spring, the program curriculum would culminate with a 5K race immediately after the Bayshore Marathon, with as many as 2,000 girls getting together to run. This year, for the first time since 2001, Girls on the Run is not active in northern Michigan. Larson needed to take a step back, and efforts to find a new director proved unsuccessful. As a result, Larson is working to turn the Bayshore Kids Marathon into a stand-in for the program she led for 17 years. The first step is getting schools involved in promoting the race and the logging program to their students. The second step is incorporating some of the educational and development aspects of Girls on the Run, alongside the inherent fitness elements of the running itself. So far, Larson and Taylor have 18 pilot programs for the Kids Marathon at local schools. Some schools are just encouraging running with recess or after-school programs. Others are looking for ways to add the community impact elements that were so central to Girls on the Run. The Bayshore Kids Marathon will take place starting at 2pm on Saturday, May 25. The race is open to students in grades K-5 and is limited to 1,000 participants. Registration is $10 and includes the race, a t-shirt, and a finisher’s medal. The registration window closes May 8. 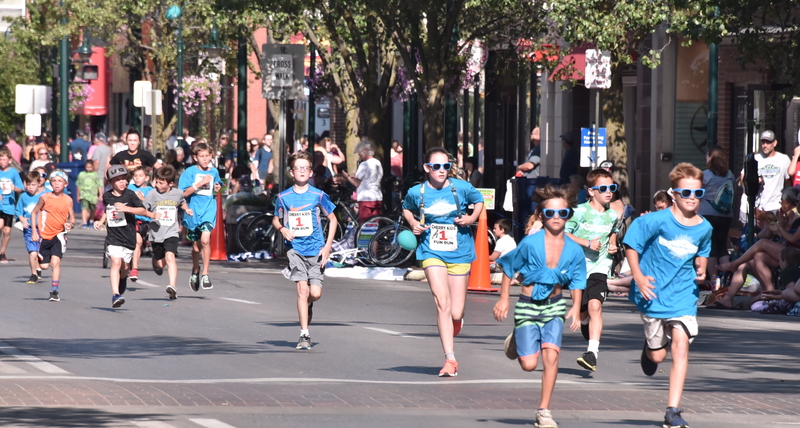 PHOTO: Taken at the Cherry Kids Mile during the National Cherry Festival, credit John Russell.